PUNE: Online vehicle spare parts marketplace boodmo was born out of a need for economical repairs and genuine components. Sumit Agarwal was stuck – dealing with a minor dent and a broken tail light of his shiny new Volkswagen Polo, he had now ensure he got the original lights, but the cost was daunting. An authorised service centre meant original spare parts, while a local garage stood for value for money but came with the risk of no guarantee about the parts used. The 25-year-old decided to buy original spare parts from an online marketplace and have his local garage fix them, a win-win. Boodmo is an online marketplace for auto components. It aims to organise the replacement parts market and make the shopping process easier and convenient. The marketplace claims to offer genuine parts without promoting any particular supplier. All parts available on the website are sorted by producers’ information and filtered by customers’ choice. Boodmo also facilitates quick and competent service for customers. The launch of the platform, however, was challenging. Yevgeny says the duo spent time meticulously preparing the online catalogue for spare parts, and listing genuine suppliers. “To execute the business smoothly we also spent a lot of time in training and teaching the workforce. The journey has been tricky and interesting. After the launch, we were able to pick the market trends and as of now we are doing well,” adds Yevgeny. Before coming to India and starting boodmo, Yevgeny had founded one of the biggest e-commerce websites in Ukraine. He had also launched and managed a similar project in Georgia for two years. Oleksandr, on the other hand, had worked in different managing roles for six years in Eastern Europe-based auto components distributor intercars.eu. Taking the path of entrepreneurship, he participated in several projects in the spare parts sector. 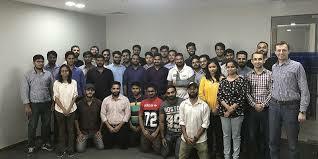 Boodmo was launched in January 2015, and has a 40-member team at present. The Indian automobile industry had annual production of 23.37 million vehicles in 2014-15, and contributes to 7.1 percent of the country’s GDP, according to a report by India Brand Equity Foundation. The automotive aftermarket comprises manufacturers, distributors, retailers, service providers and garages, which collectively spell opportunity for automobile repair services market in India. Today, there are several such players in the market like MeriCAR, a marketplace and aggregator for the after-sales automotive market, and Pune-based Sparehub an e-commerce marketplace for automobile parts and services. Delhi-based Gaadifix is a marketplace for mechanics and branded automobile spare parts. According to an ICRA report, of the total estimated turnover of $8 billion of the automotive replacement market, excluding the sale of batteries and tyres, around 75 percent is contributed by passenger vehicles and two-wheelers. Boodmo deals with high-quality genuine parts of over 3000 national and international automotive brands, and takes a margin from vendors on sales. “The first year was invested in laying the foundation of the platform. As of now we have started our sales, we believe that we will hit good numbers by December-end,” explains Yevgeny. “Boodmo addresses all complaints seriously, strengthening and enhancing the trust of customers. In addition, we provide free website usage without any subscription fees, which leads customers to believe that it is a transparent platform. Besides, suppliers have their own interface to manage their products which gives them a tool of empowerment to manage their inventories,” adds Yevgeny. Boodmo has a repository of spare parts for different cars, and the product list includes maintenance/ service parts, lubricants, brakes, suspension, body, electric components and lights, engine, steering, transmission, fuel supply system, air conditioning/heater, wheel drive and exhaust system, to name a few. The company does not deal with accessories or spare parts of motorbikes.